52.1% The amount of people that DID NOT vote for the new governor of Virginia, Terry McAuliffe. Then there is the fact that an Obama campaign bundler helped fund the Libertarian Party candidate, so that he could get on the ballot. This race was proof positive of one thing. The greatest threat to America is not progressives, the political left, the Democrats, and even unprincipled Republicans. The greatest threat to this nation is ignorant Americans who listen to an incompetent media. Then they go to the polls and vote. It is fascinating to me in an age of such widespread access to knowledge and information that Americans continue to act in such uninformed ways. I guess too many of us are lazy. What worries me, is Virginia could very easily be a microcosm of the country as a whole when it comes to the next Presidential election. The next two election cycles in America will be fascinating. 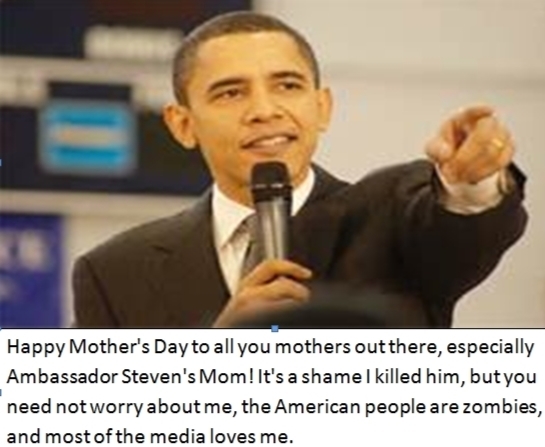 Happy Mother’s Day, Love Barack! I couldn’t resist. You need to do everything you can to make your friends and family care about Benghazi. Every so often you come across a book that causes you to reevaluate the way you view the world. The Rational Optimist is definitely one of those books. Personally, I think this may be one of the most important books of the last 10 years. In many ways I am an optimist, but when it comes to the bigger picture of the world I would have to admit I have been a pessimist for some time. While I certainly am pessimistic about the short-term in America, we are going to have to feel some pain at some point to wake people up; I am certainly an optimist now about the future of the human race and where we are headed. In other words, free-market economics should be viewed as an evolutionary concept and has done nothing but improve our situation. It is a bottom-up force. It is not dictated by government or intellectual fiat. The author undeniably proves this point throughout his book. Ridley runs through the last 200,000 years of human history through the next nine chapters. Ridley destroys the arguments of so many modern Americans, especially those that support the mentality that capitalism is ‘evil’ or that it’s selfish. “The notion that the market is a necessary evil, which allows people to be wealthy enough to offset its corrosive drawbacks, is wide off the mark. In market societies, if you get a reputation for unfairness, people will not deal with you. Ever bought something on eBay? How do you know you will get your product? Simple, you trust in the free-market that exists. You know that bad operators are expelled from the community of traders because other traders rat them out through seller reviews and ratings. (Hey, look ma, no government regulation!) The traders on eBay simply want to make money, they want to financially enrich their lives. At their core they are fundamentally expressing what the free-market capitalism system is supposed to be about: wealth through trust. Ridley makes an amazing point in this chapter that reflects the American political landscape right now. “Politically, as Brink Lindsey has diagnosed, the coincidence of wealth with toleration has led to the bizarre paradox of a conservative movement that embraces economic change but hates its social consequences and a liberal movement that loves the social consequences but hates the economic source from which they come.” This in a nutshell describes your average American of both political stripes. The fundamental problem is Americans are so poorly read on economics, the end result is the current political reality that we have. Ignorance is not bliss. I’m not going to dig greatly into this chapter. Ridley’s basic point here is that trade actually proceeded farming and that you can’t have farming on the scale we need in the world without trade. The most important thing Ridley does in this chapter is point out the danger that the organic food craze actually proposes to our future growth. Ridley takes a look at the importance of cities and how they evolved. In a word, trade. “Cities exist for trade. They are places where people come to divide their labour [sic], to specialise [sic] and exchange. This chapter is a fascinating study on how and why population rises and falls. The important thing to understand is that a Malthusian crisis is a result of decreasing specialisation [sic]. Ridley destroys the pessimists argument that the world is headed toward overpopulation. I used to somewhat subscribe to this (what appears to be) utter nonsense. The argument goes something like if we don’t do something to control population then we will not be able to feed the mouths in the world and calamity will result. The fascinating thing that Ridley proves that as a society becomes more specialized birth rates naturally fall. In other words it’s a natural evolutionary result, we don’t need some intellectual or government agency to figure out how to survive, we just do it. “But remarkably few people seem to know that the rate of increase in world population has been falling since the early 1960s and that the raw number on new people added each year has been falling since the late 1980s…Population growth is slowing even while death rates are falling….the entire world is experiencing the second half of a ‘demographic transition’ from high mortality and high fertility to low mortality and low fertility.” There is actually a peak in population and it will happen somewhere around 2075 at 9.2 billion. In reality we will be able to feed the world forever. The green movement is the enemy to progress, growth, and ironically a natural transition to a more green form of energy. They are effectively their own worst enemies, not to mention ours. Ridley destroys the belief that governmental top-down innovation works. Innovation is an evolutionary concept and governments don’t innovate very well. The real good news about the future, the thing that should make you most optimistic, is “the world is turning bottom-up again; the top-down years are coming to an end.” I know it’s hard to believe even in America, but Barack Obama, the far-left, and the center-left Republicrats are the last breath of this mentality. They may win for a little while longer and cause severe damage in the short-term, but the reality is the world and America is changing. Truth is truth, it cannot be denied, once denied it will rear it’s head again with a vengeance. This was an interesting chapter. Ridley runs through the great pessimism scares of the last century; cancer, nuclear Armageddon, famine, running out of resources, clean air, genes, and plague. He effectively demonstrates how the pessimists were wrong every time. Yet another intriguing chapter. Global warming wackos beware, I know exactly who and what you are. The important part of his argument is that he effectively demonstrates how these modern day pessimists are a danger to the future growth of the human race. They are the enemies to progress and growth, and they must be stopped. Mr. Ridley you have convinced me, I am now a rational optimist! To think, I bought your book as a result of specialization and progress. The economy had deemed the book seller Borders no longer a survivor, I bought it in a close-out sale at 70% off suggested retail.